Mother Mahalakshmi had a desire to have Her place in the chest of Lord as She was ever serving the Lord from His feet. To realize Her aim, She came to this place Shenbagaranyam and performed penance. Lord could not bear Her separation. He took Mother on His chest here on a Friday in the full moon fortnight in the month of Aipasi-October-November. Devotees believe that their wishes would be granted with their participation in the abishek to Mother on Aipasi Fridays. 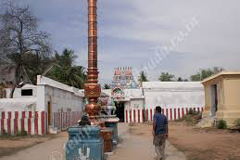 The temple ranks among 108 Divya Desas of Perumal. As an example of unity of Vaishnavism and Saivism, Nandhi the bull vehicle of Lord Shiva and Lord Brahmma are in the sanctum sanctorum worshipping Perumal. The temple is open from 8.00 a.m. to 12.00 a.m. and from 4.30 p.m. to 8.00 p.m.